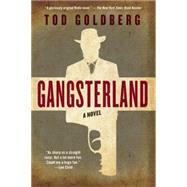 Gangsterland is the wickedly dark and funny new novel by a writer at the height of his power  a morality tale set in a desert landscape as ruthless and barren as those who inhabit it. Tod Goldberg is the author of the crime-tinged novels Living Dead Girl, a finalist for the Los Angeles Times Book Prize, Fake Liar Cheat, and the popular Burn Notice series. His essay When They Let Them Bleed” first published in Hobart was selected by Cheryl Strayed for inclusion in Best American Essays 2013. He is also the author of the story collections Simplify, a 2006 finalist for the SCIBA Award for Fiction and winner of the Other Voices Short Story Collection Prize, and Other Resort Cities. His short fiction has appeared in numerous journals and anthologies, twice receiving Special Mention for the Pushcart Prize as well as being named a Distinguished Story of the Year in the 2009 Best American Mystery Stories. His essays, journalism, and criticism appear regularly in many publications, including the Los Angeles Times, Chicago Tribune, and Las Vegas CityLife and have been featured in Salon, Wall Street Journal, E!, and Jewcy among many others.